How to Sharpen a Blurry Photo? Make Your Photos Clearer with PhotoWorks! The aim of every photographer is making a high quality shot. What if something goes wrong and your most eye-catching photos come out to be hazy? In photography, it’s a well-known defect. How can you fix a blurry photo? Download photo editing software for PC and keep reading to learn how to make your images clear with PhotoWorks! Set the Sharpness Amount. 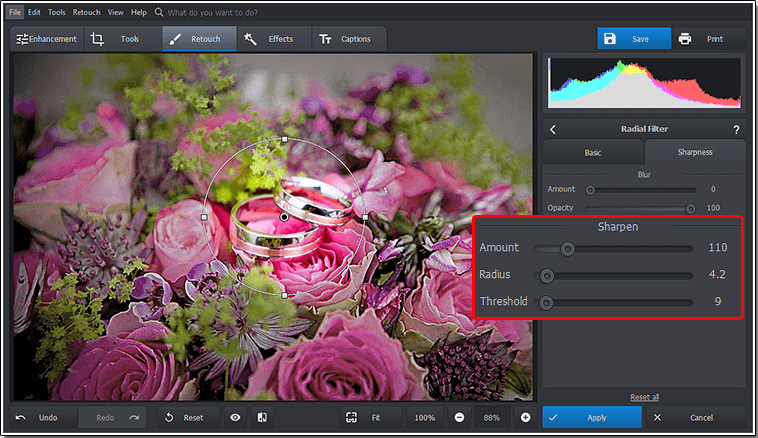 In the Enhancement tab, set the sharpness effect amount to focus a blurry photo. Moving the Amount slider to the right will make your pic sharper. Change the Radius Degree. To make the objects’ edges crisp and well visible, increase the Radius. This way, you will determine the size of the editing area and the amount of pixels to sharpen around the edges. Adjust the Threshold Setting. The optimal degree of Threshold varies from 3 to 10. If you set it at 0, every single pixel will be affected by sharpening and as a result your photo will look harsh and unpleasant for the eyes. Open the Enhancement tab. 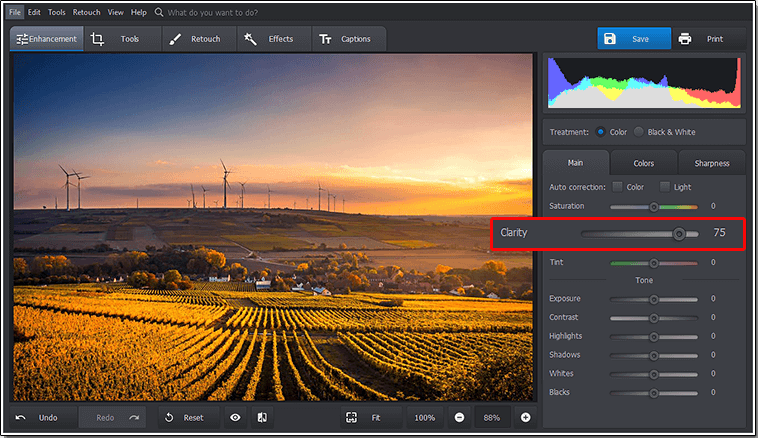 Since Clarity is a tool for global photo improving, you’ll find it in the main settings of the Enhancement tab. Increase Clarity to Make the Photo Sharper. Drag the Clarity slider out. It will help you repair a blurry photo and counter undesired flatness by bringing out its texture. However, avoid increasing Clarity in portraits unless you intend to emphasize spots, wrinkles and other skin flaws. For local sharpening, consider using the Adjustment Brush. With it, you can draw attention to a certain object in your photograph. It’s a perfect tool to make the subject’s eyes sparkling and bright. Select the Adjustment Brush. 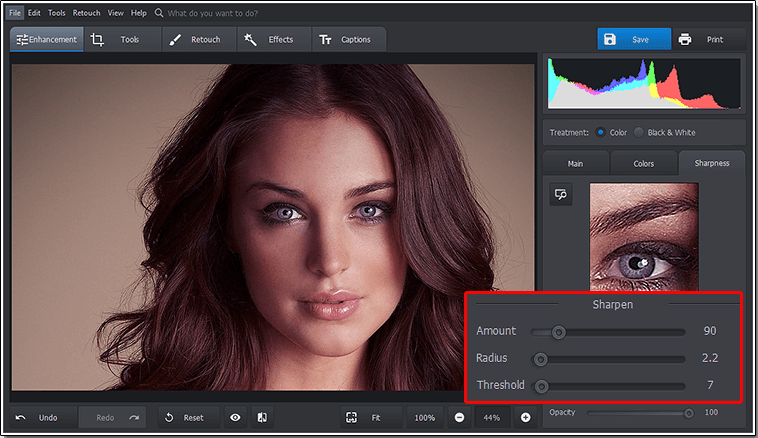 Open the Retouch tab and pick the Adjustment Brush from the toolkit on the right. Customize the Brush Settings. 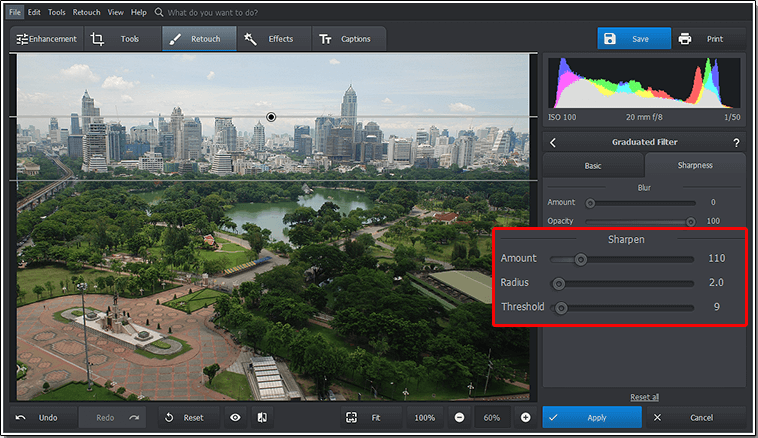 In the Sharpness tab, set the amount of the sharpening effect. Then, adjust the Radius to control the size of the area to sharpen around the edges. And finally, change the Threshold degree - at 0 each and every pixel will be affected, at the maximum degree nothing will be sharpened. Make the Selection Less Blurry. Now, just ‘paint’ the adjustment on where you want to remove blurring. All the brush settings will be applied automatically. Choose the Radial Filter. After you’ve launched PhotoWorks, switch to the Retouch tab. In the set of tools on the right, pick the Radial Filter. Select the Editing Area. Create an elliptical selection with your mouse. To do it, click and hold its left button. It’s possible to resize and reshape your selection by dragging control handles in or out. Edit the Selection with the Sharpener. To begin with, adjust the filter settings inside the oval mask. Increase sharpness and contrast, make the region less blurred but more bright and saturated. Adjust the Background Sharpness. Now, make the same selection in order to edit the area outside of it. Desaturate it and add some blurriness. This way, you’ll make the central part sharper and more noticable. Use the Graduated Filter to make particular regions in your photo more detailed by sharpening them. This tool is suitable for correcting landscapes or city views. Choose the Graduated Filter. First of all, run the photo sharpener and open the Retouch tab. You’ll see the Graduated Filter in the editing toolkit - click on it. Select the Area to Unblur. Press and hold the left button of your mouse to make a selection for enhancing. It can be the upper half of the picture (the sky) or the lower one (the ground or the water), or edit them both in turn. Change the Graduated Filter Settings. 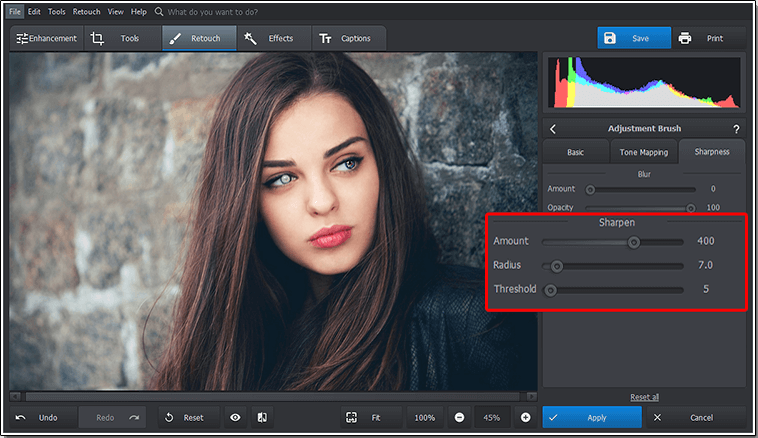 In the Sharpness tab, adjust the Amount, Radius and Threshold degree just the same way as you did while trying the Radial Filter and the Adjustment Brush. By moving the sliders, determine how strong the effect will be, how many pixels will be affected and how crisp the edges will become. Feel interested? 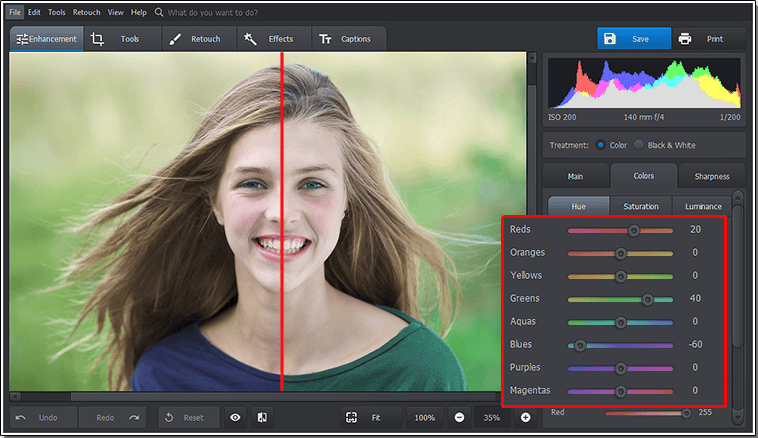 Then launch the program and start editing your pictures right now: restore blurry photos, adjust color balance, apply special effects and make your average images stunning!